Call us if you would like help designing a track layout. We need to know the size of the space you have. For large systems we need a planning fee refundable on purchase of track. Slot It gears provide higher performance and quality that original equipment gears that come on most 1:32 scale slot cars. Slot It has gears to fit virtually any 1:32 scale slot car with 3/32" axles and .078" motor shaft. Some cars with limited body or chassis clearance arouund the gers ma not be able to use all sizes of Slot It gears or may need some carving on the chassis to provide the necessary clearance. Slot It gears are not always compatible with original equipment gears, so for best results the pinion and the driven gear should be replaced with Slot It gears together. Slot It offset crown gears allow the motor shaft to be below the axle center, and thereby allow the entire motor to sit lower in the chassis for a lower center of gravity. They can only be used with a motor mount installation that places the motor shaft and rear axle in the correct relationship. Slot It's offset inline motor mounts, SICH22 and 24, give the correct alignment. They can be used with the HRS chassis and can be fitted into Slot It RTR cars. They can also be used in scratchbuilt chassis. REMEMBER YOUR FIRST slot car set? Endless hours of fun watching two cars circle the track until one falls off and the other one gets sent into orbit from the sudden surge of power. It may lack the rose-tinted aura of your childhood memories, but the new digital slot-racing system is a huge improvement. The greatest change is that you can get eight cars on the track, and overtaking is possible thanks to the new cross-over sections. Because all of the power comes from one central console, you don't get surges when somebody crashes, which isgood because crashing is a certainty. Even on beginner setting the cars are fast and tricky, so it's easy to get over-enthusiastic. The higher settings are ideal as you get better, giving less 'grip' the more advanced the setting - which means that you can actually drift around corners. The digital sets also have a number of extra functions that you can buy in separate sets, such as a pitlane that allocates each car with a fuel load, allowing timed refuelling stops in endurance races. If you already own slot cars, it's not a problem as you can convert any make of analogue car or track to digital, and run any slot car on a Ninco track. They may be expensive, but Ninco's slot racing sets are robust and easy to use as well as brilliant fun. When one car comes out of the slot the other receives a power boost and could result in the other car crashing as well. Independent power per lane is recommended, it allows each car to be controlled without any external influence. Scalextric use ac transformers and the power base converts the power to dc. Our experience shows that scalextric power and controllers are not as reliable as other makes. Ninco & SCX make independent power base tracks. You wil need an extra transformer. SCX make professional controllers with a choice of resistors and braking. 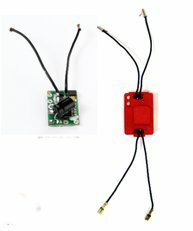 Ninco make an electronic controller besides their standard one. We can supply professional controllers and other variable output power supplies for the expert and or club use. Ninco digital use standard track with a digital console and lane changinging pieces of track. The console has 7 different race programmes. We now offer a delivery and set up service ask for details. Ninco up to 6 or 8 cars indepently controlled on 2 lanes. Scx, Carrera and Hornby have digital tracks for up to 6 cars. Scx is now up to 6 lanes with up to 8 cars. Ninco digital will be up to 8 lanes. Crashing into the car in front is a rule that has to be enforced.. Hornby digital is compatible with sports track However, with Hornby's reputation for poor electrical connectivity it is hard to imagine that the digital signal passing through these connections will not get corrupted. Scx digital has an interesting pitlane with fuel loads and adjustable braking. races can be with or without refuelling. The Ninco chip is easy to fit to any car it fits across the pickup. Up to 8 cars on 2 lanes! Existing Ninco race sets & circuits can be digitalized with NINCOs N-Digital Conversion Kit; set multiple race programs in all categories (rally, raid, GT, etc.) and on the 3 track surfaces (asphalt, snow and off-road). Track Compatibility is 100% with existing NINCO asphalt, snow and off-road tracks and by using the NINCO Adapter Tracks, other brands of non-digital slot car track systems can be used with N-Digital. Car Compatibility is no problem at all! Any analog (non-digitized) car of any brand can be fitted with a NINCO N-Digital Decoder Chip. Digitalization is virtually plug & play, without drilling holes, changing the chassis, or causing irreversible damage to the car. Up to Eight (8) cars can race on a track simultaneously its the largest starting grid available. Lane changes are accomplished with absolute precision on Lane Change Tracks as each car passes, and can be set far in advance of the actual change. Changes occur in a straight line from right to left, in a straight line from left to right, and passing from lane 2 to 3 and 3 to 2 with the Multi-Lane Kit. There is no way to accidentally change lanes, even when the cars are very close. Naturally, with the Pit Lane Kit the drivers have access to the pit lane as well. Multifunction Digital Control Unit is the heart of the system, allowing race control for up to eight (8) lanes of racing. The consoles data display screen manages seven (7) different types of races for individual and multi-players. It provides racing information and sound signals for all drivers: time, lap and fastest lap, fuel consumption simulation, management for cars with and without lights, fastest reaction speed from driver to car. The 3 Amp N-Digital Transformer provides the power for up to four cars. Race Position Control Tower shows the race positions of up to eight (8) cars, laps remaining and can be positioned anywhere on the circuit. Also, it swivels 360° for ease of viewing. The main features are designed to enhance racing to the most professional level available, making NINCO N-Digital the benchmark performer in the slot racing world. How Slot Car Racing Works Now, decades after the slot car craze hit the United States in the 1960's, many enthusiasts still consider it as their hobby of choice. Whgen the Amercans started to leave their UK bases in the 1960's the hobby in the Uk started to wane. The americans also did not like the Englisth make fast chassis cars with 'jelly' moulds. The hobby started to change. Slot cars are miniature electric scale model cars that race along a fixed track. The "slot" in the name comes from the channel or groove in the track that guide the vehicles through the twists and turns as well as on the straight sections. The slots are lined with two metal rails. You can purchase a slot car set, which includes all the necessary parts to start racing right out of the box; however, additional track pieces, car bodies, controllers and other various after-market components are available for purchase, too. We always suggest buying another set of cars in case a car gets damaged. By having a second set will give you the versatility of racing another car. Although slot cars gained popularity in the 1960s, it was way back in 1912 when the Lionel Corporation first created the original slot cars, according to Wikipedia. Similar to model trains, these early slot cars sped along a raised track, and racers could increase or decrease the speed of their car by adjusting a switch on the track's power supply. Slot cars are more than just tiny mock-ups of real cars, some are lovingly built from scratch by slot car enthusiasts and most cars, whether store-bought or hand-crafted, are modified for better performance. Driver skill plays a part in slot car competition, too. Aside from a small guide on the underside of the car, there's really nothing keeping the cars fixed onto the track, so some amount of driver proficiency is required to keep them from flying off in the turns. However, home users and amateurs tend to use magnets which makes a rarers car uncompetitive as the magnet cars keep the cars on track. To understand how this hobby caught on and why so many are still racing slot cars, let's look at some of the details of this hobby on the next page. Slot Car Components Some slot cars have a significant level of detail. Slot cars come in a wide variety of sizes, but the most traditional and popular slot car size is the 1:32 scale. This scale means that for every 1-inch (2.54 centimeters) on the slot car there are 32 inches (81.28 centimeters) on a full size automobile. Other scale sizes include 1:24, 1:43, 1:64 and HO. The HO scale is a less-precise comparison measurement than the other scales, and is usually considered more of a toy for kids. The HO stands for half of the zero scale. Since the 1:32 scale is most commonly used as the scale of choice for hobbyists and slot car racers, let's take closer look at the breakdown of some basic elements of a 1:32 slot car: The body (or shell) is a solid molded poly/plastic piece that fits over the chassis of the car. As with real cars, the weight of the body and the distribution of that weight are a consideration in building a performance slot car. An interior section is usually attached to the body as well. Many cars even have a detailed driver figure, and most interiors tend to be only half the height of the body in order to leave room for the motor and other driveline components. An electric motor can be placed in the middle, front or rear of the car. Motors are rated in revolutions per minute (RPM) or by their speed, which is determined by the amount of voltage the motor receives. Copper or steel braids (or braided wires) provide power to the car by making contact with the rails on the track. A guide (or guide flag) is the plastic piece under the chassis that guides the car along the slot in the track surface. The guide pivots in the slot and also holds the braids. Gears (or gear sets) affect the slot car's speed and acceleration. Standard gears, such as the small gear attached to the motor (called the pinion) can be upgraded with aftermarket parts to increase performance. Magnets are placed in the front and rear of the slot car to provide downforce on the vehicle to ensure that it doesn't come off of the track. Some slot car enthusiasts prefer to race without magnets and may choose to add lead weights to their car or simply race with no weights or magnets at all. Some modern slot cars even have a microchip that allows them to operate on the same track as another car or to change to a different lane at pre-determined points on the track. Almost all of the components of a slot car can be upgraded, refined, tweaked and improved, but without a track a slot car is nothing more than a somewhat realistic car model. Up next, we'll take a look at how slot car tracks are constructed and how they provide power to these miniature race cars. Slot Car Tracks What's that wonderful smell? While racing a slot car you may notice a slight burning smell after a while. In some cases, it may mean that the car's motor is starting to go bad and needs to be replaced, or if the car hasn't been run in a while it may emit the same burning smell. Heated power supplies also have a distinctive smell about them that racers recognize in an instant. However, those aren't the only scents associated with slot car racing. Some original slot car racers may notice the smell of 'oil of wintergreen' coming from their tires. The oil was used to soften the tires for racing and is occasionally used on the tracks and braids as well. A slot car track is made of plastic segments with two steel rails in each lane. These steel rails run the entire length of the track. One of the rails provides power to the slot car while the other rail provides the ground. Some slot car tracks are composed of several smaller track pieces which are clipped together using interlocking sections; however, other slot car tracks are made up of a relatively small number of longer sections of track which means that there are far fewer seams throughout the entire race circuit. This design also provides better or less-interrupted power supply to the cars. The track receives power from a power supply that plugs into a wall outlet. The power supply inverts the alternating current (AC) from the wall outlet into direct current (DC). Voltage supplied to the track by the power supply is typically between 12 to 18 volts and 1 or 2 amps. However, more advanced 1/24 scale slot car clubs or racers may add additional power to the track using individual power supplies for each racing lane. These can provide each slot car lane with as much as 10 amps of power, although most of the cars won't use more than 5 amps during the race. When additional power supplies are added, the powerbase -- the segment of track where the power supply attaches -- may need to be modified to handle the additional power. Now that we know how the tracks receive power, let's find out more about how the cars handle the various types of tracks and how some tracks are built for realism. Slot Car Track Layout One of the most detailed aspects of slot car racing is often the track layout. While some slot car enthusiasts focus more on the racing aspect of the hobby, modifying their cars for speed and reliability, some take the time to build elaborate tracks complete with landscaping and plenty of other intricate details. For instance, there are many different types of special track segments that can be added to a track to make racing more competitive. Some track pieces are designed to bring the cars closer together and force a racer to speed up and move ahead of another car or risk being pushed off the track. Other pieces create hairpin turns or steep inclines where the racer has to determine when it's appropriate to speed up or slow down. Some enthusiasts prefer to take their cues from the cars themselves and model the tracks after real-world NASCAR tracks, rally courses, Formula 1 race circuits or other professional racetracks. There are several books and even computer programs to help racers design and build their own tracks. Some racers, who don't mind getting their cars a little dirty, may even build realistic rally-style tracks. These tracks simulate off-road conditions by adding elements like cocoa powder or flour to give the look and feel off their slot car driving through dirt or snow. 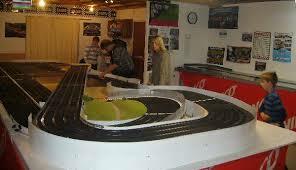 Special slot cars are designed for optimum performance on these simulated rally tracks. On more traditional tracks, some areas may be altered in order to increase the likelihood of crashes. These types of tracks are designed to test a racer's skill. Some sections of the track may have twists and turns built into them to simulate the effects of driving on ice. A recent advancement in slot car racing has been the introduction of digital tracks. These digital tracks allow racers to switch from lane to lane. Although crossover sections on slot car tracks are nothing new, the digital tracks allow the lane switch to happen at specific points on the track only when the driver chooses to do so. These types of tracks and slot cars that contain microchips allow multiple racers to use the same lane on a slot car track -- something that's not possible on traditional slot car tracks. Although tracks have a significant impact on how the car performs, slot car controllers affect the vehicle's speed and braking. We'll learn about the controllers next. Slot Car Controllers A slot car needs more than outright speed to win a race; it also requires controlled acceleration and breaking, too. Analog slot car controllers do this by distributing the desired amount of voltage to the car. A trigger on an analog controller moves an electrical contact along a resistor. As the trigger is squeezed, more voltage is sent to the slot car's specific track, which in turn increases the vehicle's speed. The controller's resistance is measured in ohms, and changing the amount resistance has a positive effect on the slot car's response time. Some modern controllers offer slot car braking systems as well. Instead of just releasing or easing off of the trigger to slow the car down, some controllers come with braking systems that, at the push of a button, send negative voltage to the car's electric motor. This slows and stops the car much faster than a conventional controller can. Other even more advanced controllers allow racers to fine-tune the amount of braking power the controller applies to the car. Electronic controllers, unlike analog controllers, do not use the variable resistance method for power delivery, but instead use an electronic circuit to dispense the correct amount of voltage to the car. Improved car control and the ability to command a wide array of cars with varying magnet and motor setups are the primary advantages of electronic slot car controllers. Remember, if you're in the market to buy an electronic controller, a new slot car motor or even a complete slot car racing set, it's always a good idea to do a little research. Find out what you like and don't like and pay attention to what other enthusiasts are saying, too. Spending a little extra time up front may end up saving you a lot of time, money and effort later on. Ask us on 020 8421 5922 if you need some help or advice.